Florida is a seductive domestic tropical paradise and a desirable destination for travelers looking to explore its magical palm tree fringed coastline with a plethora of activities for anybody from party loving youngsters to peace seeking retirees. The Sunshine State is also the among best family travel destinations to visit Walt Disney World, Universal Studios, Sea World in Orlando and Busch Gardens in Tampa, and setting off on one of many fabulous cruising adventures. The Florida Peninsula is divided into 4 main territories, namely, the Panhandle, North, Central and South Florida offering various Florida vacation spots based on your preferences. Spanning from Pensacola to Florida Keys, the Sunshine State is the surreal, imagination inspiring retreat located right in the southeast of the US. The mild balmy climate of Florida during the wintertime draws a plethora of visitors and temporary residents escaping the cooler weather during the winter month and returning north when notoriously scorching Florida summer months roll around the corner. The coastal geographical location of Florida creates an unpleasant effect of frequent thunderstorms, especially during the summer months. Therefore, the best time to visit Florida is generally during November through April with an added bonus of finding the best Florida travel deals around this time of the year. No matter if you are looking for Florida travel deals to see the Magic Kingdom of Disney World, soak up the beach atmosphere or go shopping or clubbing, or to see many other Florida attractions, read below where we guide readers through the maze of popular Florida places. From famous Key West beaches to historical St Augustine attractions, to fabulous oceanfront villas at West Palm Beach and, finally, Cape Canaveral Kennedy Space Center, Florida is a treat to uncover for just about anyone. Miami is among the hottest Florida vacation spots, the glitzy tropical retreat for rich and young flocking to its edgy nightlife scene, high end shopping, fashion and untamed lifestyle. To describe the World Cruise Capital is to compare it to an eclectic melting pot of filthy rich citizens, immigrants from Latin America, Europe and Israel, celebrities casually strolling the streets of the city or sipping martini at the hottest nightclubs along the South Beach, fashion conscious shopaholics abusing their credit cards and monokini clad babes baking under the hot tropical sun of the Everglades. The city has a sultry and pulsating aura of the ultimate party destination with no concern for the reality of the world. The main attraction in the city is without a doubt its beaches, especially gorgeous beaches along the Biscayne Bay. There’s an endless selection of museums, art galleries and cultural events for visitors to see. The local Seaquarium and the Zoo house a variety of tropical birds and animals for kids to see, while the Lincoln Road Mall is a quintessential attraction for parents to shop and people watch. Fort Lauderdale, once the Mecca for rowdy spring break crowds, has blossomed into one of the sophisticated Florida vacation spots for more mature crowds seeking cosmopolitan entertainment and outdoor pleasures of its sunny drenched coast. Start your day with a peaceful stroll along the Beach promenade opening spectacular views of the beaches and with plenty of places to satisfy your hunger and thirst. Downtown area is full of museums, galleries and fantastic restaurants and shopping. Make sure you visit first in the US Butterfly Garden that will be a thrill for adults and kids of all ages. Naples is one of the most loved Southwest Florida vacation spots, most popular retirement destination situated on the sandy Gulf of Mexico. The city is blessed with a plethora of cozy beaches, golf resorts and shopping venues. Naples City Pier is the place to be opening gorgeous views of the Gulf and a perfect place to fish and watch a variety of Florida wildlife. The Tin City is shopper’s haven with a ton of shops, boutiques selling everything from souvenirs, apparel and art. 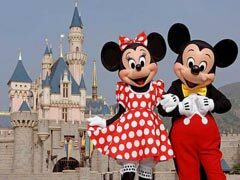 Orlando is the premiere family vacation destination made famous due to its world’s famous Disney World theme parks. However, you will be surprised to learn that there are plenty to keep you happy with high end cuisine, great shopping and nice museums. Despite this fact millions of people come flocking to many other theme parks in the city including Gatorland, Universal Studios, SeaWorld, just to name a few. Shopaholics rejoice! The Florida Mall in the city is one of the most gigantic shopping centers in the US. Daytona Beach is a city in the Central part of Florida famous for its beaches and, most, importantly the motor car racing events ranging from car racing to motorcycle and even bike races. The most popular tourist hang out spots are the Beach Pier and the Boardwalk providing loads of family fun along the way. Tampa lies on the west coast of Central Florida and is known for its highly popular attraction Busch Gardens Tampa Bay, which combines Zoo and theme park in one. But the city is not all about play, lots of major corporations line the downtown area. Its historical Ybor district is great to tour by day or night with lots of ethnic shops, restaurants and entertainment options. Its sister city St Pete, on the other hand, is an artsy destination that guides you through with a wealth of great museums like Museum of Fine Arts, Salvador Dali Museum and plenty of interesting venues to keep cultural connoisseurs entertained. Close proximity to beaches creates one of the highly sought after holiday destination according to many travel guides. Clearwater does not only offer miles of beautiful beaches but it is home to the infamous Scientology Church headquarters. Plenty of water spots, Pier 60 shopping and entertainment and Sand Key Park, a true nature lovers’ paradise are sure to keep you entertained during your best Florida vacation. Fort Myers is a place located in close proximity to Sanibel Island where winter homes of famous figures like Thomas Edison and Henry Ford are located in the midst of blooming gardens and meadows. Besides visiting this highly popular attraction of Edison Ford Winter Estates, visitors would love Butterfly Estates, art galleries and Groove Street entertainment joints. Jacksonville, one of the largest cities in the continental US is like a giant octopus stretching its arms across 800 square miles of territory on the coast of the Atlantic Ocean in the Northeastern part of the state. The downtown area has two main districts drawing crowds of tourists due to their entertainment and culinary scene, namely, the Jacksonville Landing and the Hemming Plaza. A plethora of art and history museums and its Jax Beach are what keep tourists coming year after year. 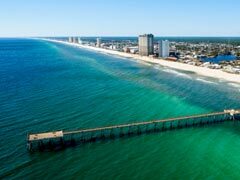 Panama City is one of the favorite vacation spots for families and couples located in the Panhandle part of the state on the shores of gorgeous Gulf of Mexico beaches providing its guests with theme parks and an endless array of great entertainment and restaurant options. 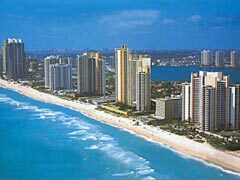 Destin is a high end resort offering pristine beaches and emerald hued clear waters. Its geographical location makes it perfect for green lush golf resorts and sailing ventures. A short drive will guide you to the famous Fort Walton Beach community that is also famous for its gorgeous sandy beach line. Our Florida travel guide has introduced you to many popular vacation places in the state, however, there are many more, so look for your Florida travel deals and head to the Sunshine state.